A dance gathering seen from a distance. Such dances were often known as beer dances (gbere buda) at feasts since they were accompanied by drinking and eating through the night. The occasions for such feasts were varied, including mortuary ceremonies, marriage or simply to gain prestige. One man is wearing a colonial-style pith helmet. 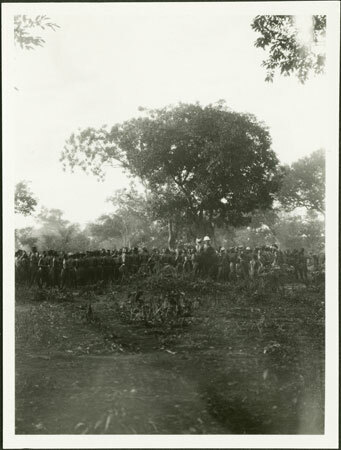 This large gathering was held at the compound of Prince Rikita (son of Gbudwe). Notes on print/mount - "53"
Other Information -In Man and Woman among the Azande (Faber & Faber 1974, page 115-6) E. E. Evans-Pritchard notes that "..when I [the narrator] went through the settlements I told all the youths about the dance. Some of them told me "we have already heard the dance-gong, that which you beat in the morning." I said to them "all right, I am most eager to dance today." ... The master of the dance stayed away for a short time and then he came to where we were and saluted ... He then went to the homestead of the dance and mounted the gong there. All stopped dancing. He spoke to them thus 'it is I, Aramasi, who am giving this dance today to lament my younger brother with it. ... He then got down from the top of the gong. Balingbandali mounted the gong [to beat it] and Nambaga took possession of the drums... the dance began in full swing... When Azande dance at night they do not wear their best barkcloth, just an old barkcloth..." A note on the reverse of [1998.341.375.3] states that this feast gathering took place at Prince Rikita's compound. Morton, Chris. "Zande prince's feast dance" Southern Sudan Project (in development). 03 Jan. 2006. Pitt Rivers Museum. <http://southernsudan.prm.ox.ac.uk/details/1998.341.376.2/>.